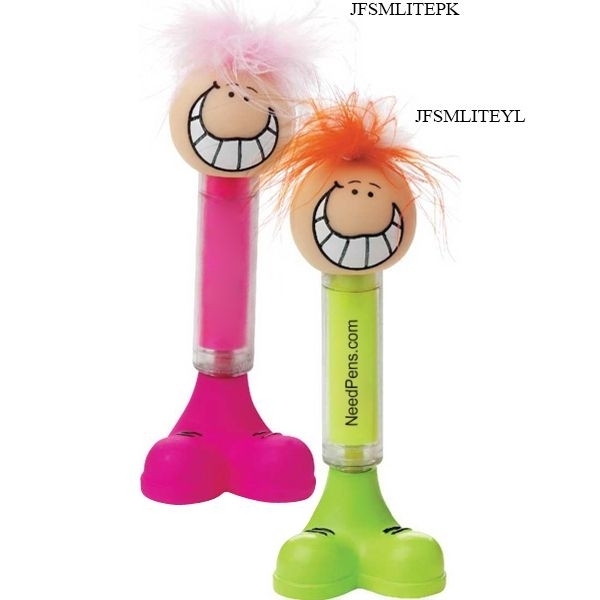 These fuzzy-haired highlighters are available in two color configurations. 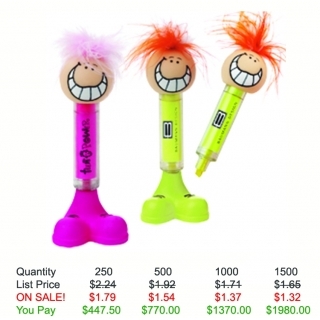 Each one stands on its own two feet (the removable cap) and features a traditional highlighter. Chisel-tip highlighter. Save on this custom pen with Free Setup, Free Rush Service, Free Artwork and Free Shipping. Warning: Choking Hazard - Small parts. Not for children under 3 years. Product Features: Chisel-tip highlighter, feet-shaped base, base serves as cap. Highlighter Color: Pink, Yellow - Ink color matches barrel and cap. Shipping Weight: 500 pieces per carton, 32 lbs per carton - FREE Shipping! The Highlighters were a huge hit at our last event, and I can not thank you enough for your staff's friendly service and the extremely fast turn around! We didn't give you much time to fill the order, and we are so grateful for your willingness to help us in such a bind! We will be ordering again in the near future for sure! Thanks again!